Four airmen were at the right place at the right time when a father of three children was caught by a strong current in the Buttahatchee River in Caledonia, Mississippi, over Memorial Day weekend. Staff Sgt. Joshua Keith, Airman 1st Class Kyle Carpenter, Senior Airman Ryan Werner and Staff Sgt. Alexander Gordy, all part of the 14th Operations Support Squadron at Columbus Air Force Base, helped save and revive a father who jumped in after his three children, according to a news release. The children’s grandfather also jumped in to help, but after struggling with the current, was unable to be revived and passed away, the release said. “We were just enjoying ourselves at the river, and we heard someone screaming ‘my, my kids’ off in the distance,” Staff Sgt. Joshua Keith said. “We stood up and looked and saw what we thought were two kids that were caught in the current. We saw two people jump in after them so we thought they were alright and sat back down. Then a couple seconds later we saw someone else jump in and one man struggling to get back to the bank. That’s when we noticed there were three kids in the water not two, and realized that they needed our help,” he said in the release. Staff Sgt. 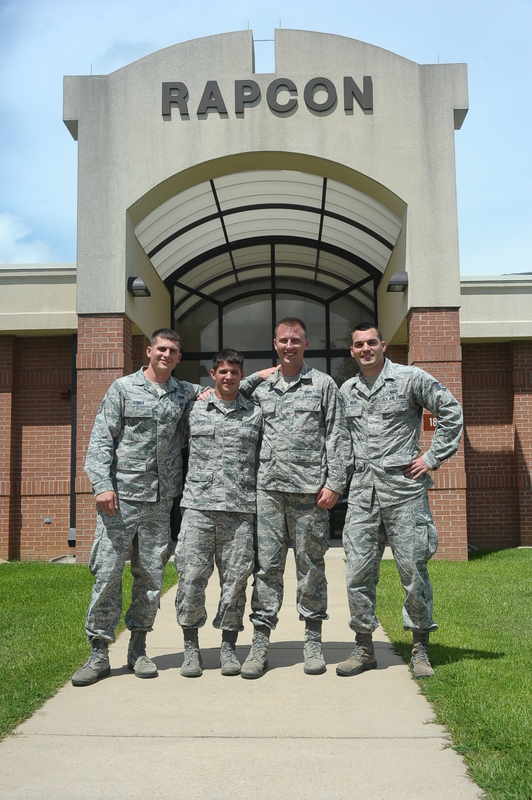 Alexander Gordy, Airman 1st Class Kyle Carpenter, Senior Airman Ryan Werner and Staff Sgt. Joshua Keith pose for a photo June 24 outside their place of work, the Radar Approach Control at Columbus Air Force Base, Miss. (Airman John Day/Air Force photo). The father was able to get the kids out of the current but not able to get out of the river himself. The airmen had to run down the river banks to get closer to the distressed swimmers and then swam “50 yards of cross currents to get to them,” Senior Airman Werner said. After getting to an accessible shoreline, they dove in for the father and grandfather. While the airmen were still searching in the water, additional onlookers began assisting in the search. One bystander finally located the father and dragged him to the shoreline, but the father was not responsive, the release said. “He was completely blue and was not breathing so I started CPR on him,” Keith said. Airman 1st Class Carpenter quickly joined in to assist. After almost four minutes of CPR, the father started responding. Emergency responders were at the scene when the airmen finally got the grandfather out of the water. While the paramedics performed CPR, Keith took the children aside into “their car and gave them stuffed animals trying to distract them,” he said. The release stated that the grandfather passed away. The family’s identity was not made public.